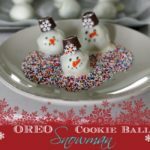 I don’t know who loves this OREO Cookie Ball Snowman Recipe more, my kids or my mother. 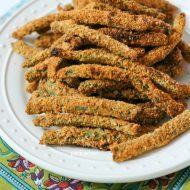 They are so fun to make and so delicious to eat. I loved making the OREO Cookie Ball Thanksgiving Turkey, so this was an idea I had been playing with for a few weeks now. 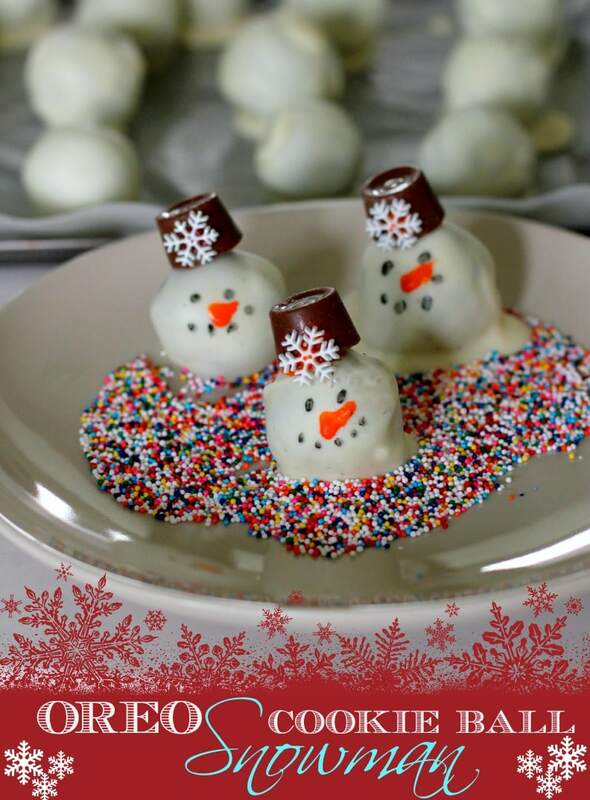 To make these OREO Cookie Ball Snowmen, you will need to make them with the original OREO Cookie Ball recipe. 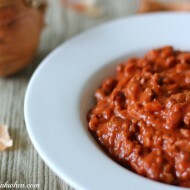 It is a quick and easy recipe, and one that is SUPER delicious. 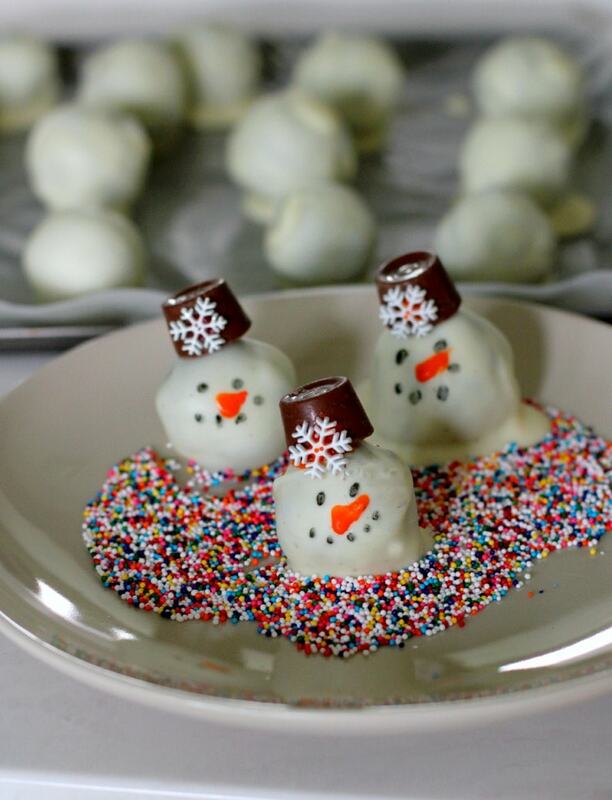 A delicious and easy OREO Cookie Ball Snowman Recipe. Take the entire package of OREO Cookies (filling and all) and crush them in a large gallon ziplock bag. Empty cookie crumbs into large mixing bowl. Place cream cheese in large mixing bowl. Mix well on medium speed. Use a 1" cookie scoop and create round balls with palms of hands. Place on a cookie sheet. Place cookie balls in freezer for about 10 minutes. Melt Baker's Chocolate per instructions. Dip Cookie Balls into chocolate and then place on a wax paper covered cookie sheet. 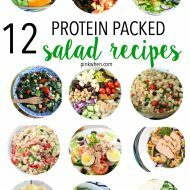 Place in the refrigerator for an hour to harden. Take icing and dab a bit on a Rolo candy and place on the top of the cookie ball. Use the gel icing to create eyes, nose, and mouth. Add a dab of icing to snowflake and attach to the Rolo for decoration. You can also try different candies and sprinkles to change things up a bit. I like how simple and easy these were, and my family always enjoys these delicious OREO Cookie Balls. These are so cute and so fun. It’s hard to eat just one, and the kids really love to try and make these. 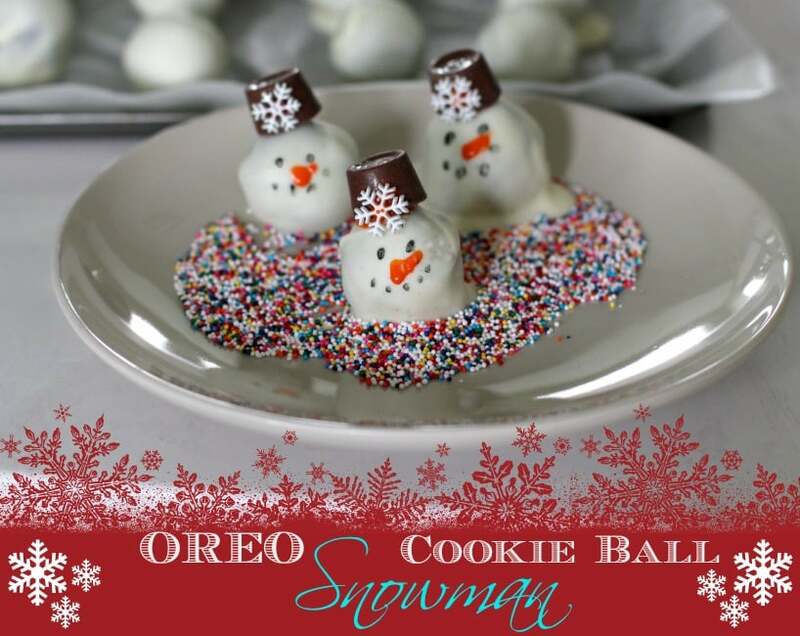 Make sure to print out the recipe and make your own OREO Cookie Ball Snowman this Christmas! I love them! I love anything with sprinkles. You do see a lot of Oreo cookie ball recipes flying around a lot in the holiday season, but I have to say that this might be my favorite version. These are super cute. 🙂 The kids really enjoyed making them, so that was the best part. Why are they white and you use chocolate? It’s called white chocolate 😉 Ha! You can find white bakers chocolate next to the other bakers chocolate.